So you want to get your son or daughter out there on trails or track with you, but how do you know which bike to start them off on? 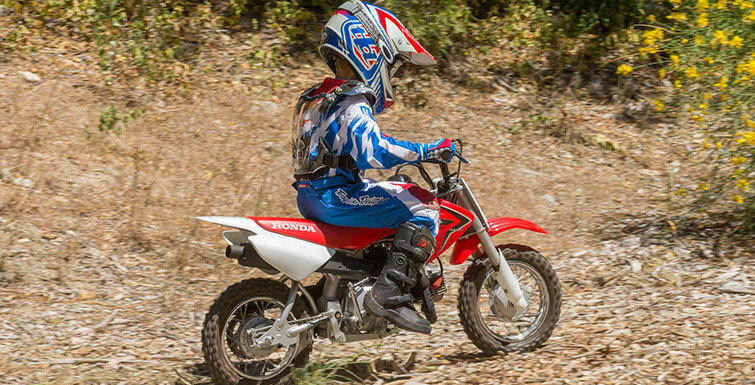 We put together some pros and cons of the most popular 50cc dirt bikes available so you can be sure to get your little one on the best bike for them. Regardless of whether you’re a diehard motocross rider or new to the two-wheeled world of dirt bikes, there’s a question that all moto-minded parents struggle with. What first bike should I get for little Johnny or Sally? Wide ranging factors come into play before making that final decision. Start-up cost is an obvious consideration, but in truth it shouldn’t be at the top of the list. Instead, it’s important to take your child’s height, weight, age, natural skill level, ability to master other two-wheeled modes of transportation (i.e. bicycle), their willingness to learn, and where you intend on taking your child riding into account. It may be overwhelming for a parent to feel confident in their purchasing decision. Fortunately, there are a plethora of options available. Whether your child’s interest lies in learning basic skills while putting around in an open field, or taking to the motocross track with dreams of being the next AMA Supercross Champion, there’s something for everyone. As a rule of thumb, beginning level riders should start out on a motorcycle that they comfortably fit on, and then choose the lowest engine size available. This article is directed at parents with young kids in the 3- to 7-year-old age range, where a 50cc motorcycle is most practical. Our objective is to dissect the various 50cc offerings in an effort to put your mind at ease and help ensure that your child has a pleasurable riding experience. The Yamaha PW50 has a long history of being the first bike for many racers and riders, providing a safe and reliable platform for learning to ride. The Yamaha PW50 has been around for decades, and justifiably so. The venerable air-cooled two-stroke is an outstanding choice for young beginning-level riders. 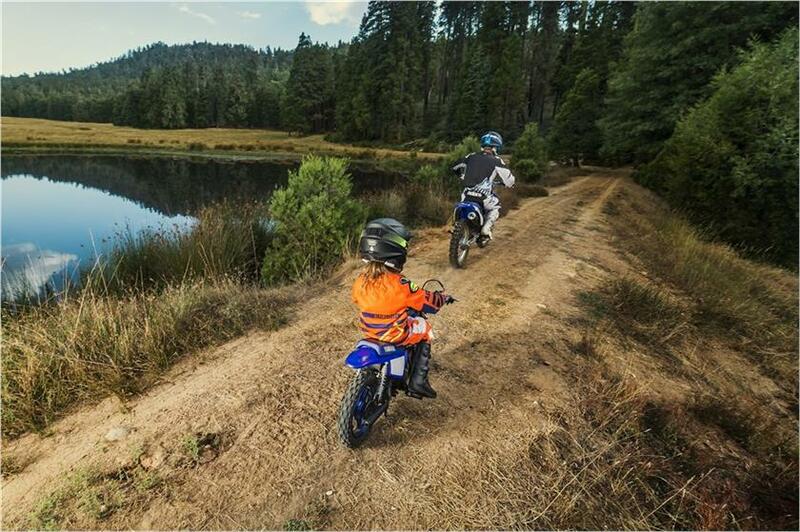 The 18.7-inch seat height and 10-inch front and rear tires keep the PW50 close to the ground for children as young as three years old. An automatic, single-speed transmission simplifies the riding experience. There’s also an adjustable throttle stop screw for limiting top speed, which comes in handy while your child is learning to master throttle control. 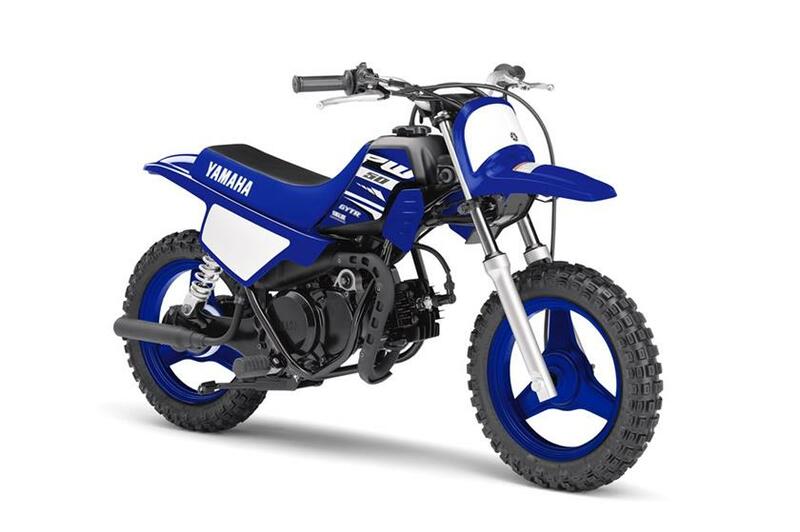 Yamaha’s PW50 also boasts a shaft drive system that eliminates chain maintenance and takes the dangers of an exposed chain out of the equation. Additionally, Yamaha’s autolube injection system means that there’s no need to pre-mix fuel and oil for the two-stroke engine. This is a perk for parents who are new to motorcycle maintenance. Speaking of maintenance, the PW50 can take a licking and keep on ticking. For that reason, the bike can be passed down through generations of new riders. However, general upkeep is unavoidable. The good news is that ProX makes a variety of replacement parts that are less expensive and more durable than OEM/stock components for the Yamaha PW50. 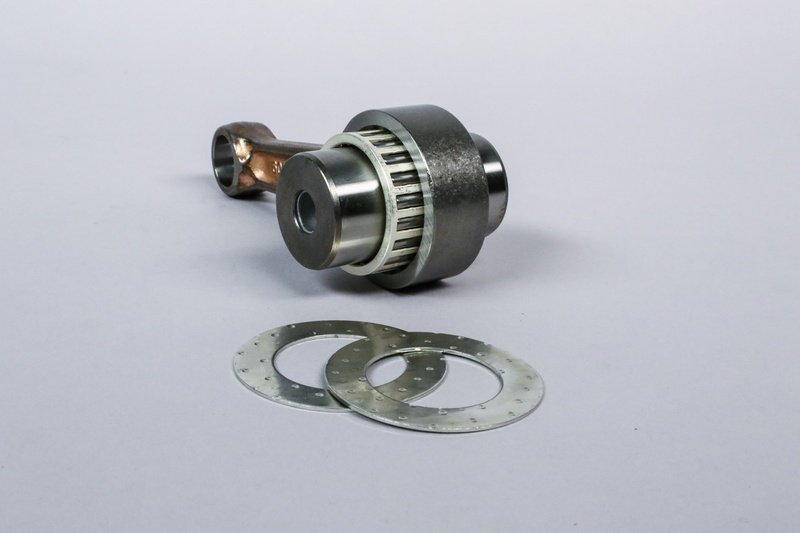 From air filters to throttle cables, connecting rods, crankshaft bearings, seals, gaskets, pistons, rings and more, these items provide performance without taking a chunk out of your child’s college fund. 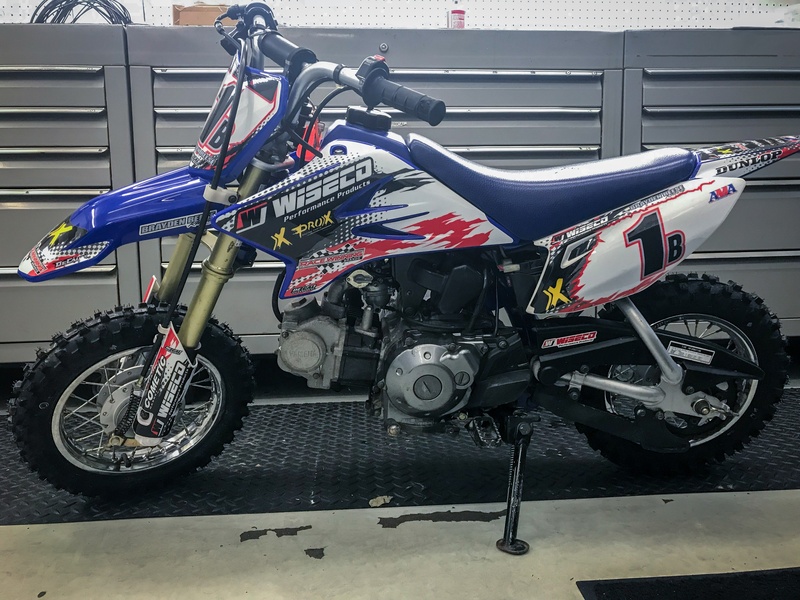 If cracking open the 49cc two-stroke engine seems like a daunting task, we suggest purchasing the ProX parts and taking them with your PW50 down to the friendly local Yamaha dealer for a tune up. PW50s can practically achieve immortality with the ability to rebuild them affordably with ProX parts. While Yamaha's long-standing 50cc staple motorcycle has been the PW50, they also offer a four-stroke version with more features, the TT-R50(E). The TT-R50 is also a great introductory motorcycle that proves easy to ride and to learn on. It's great for the young ones, with its 21.9" seat height, only a couple inches taller than the PW. The suspension sees an upgrade from the PW as well, with inverted forks and an upgraded shock. The TT-R also features a 3-speed automatic-clutch transmission, introducing the process of shifting to young riders, without needing to learn the clutch quite yet. The newer models even feature electric start! These kids have it too good these days. Here's a TT-R50 ProX was able to help a young racer put his own touches on. The TT-R50 is Yamaha's slightly taller, more featured 4-stroke counterpart to the PW50. Check out all the details on the TT-50 here. The CRF50F is Honda’s answer to the Yamaha PW50. 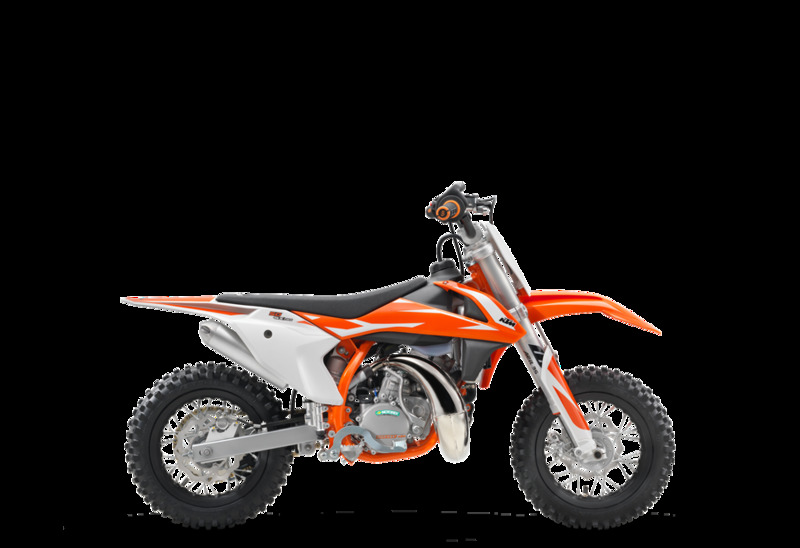 An entry level machine, the CRF50F has an automatic clutch for ease of use, throttle limiter, drum brakes, and 10-inch tires front and rear. Where the Honda differs is in the transmission layout, safety features, seat height, and engine type. A three-speed transmission will allow your child to learn the nuances of shifting through the gears without the need for a clutch. This is a big plus for encouraging rider development, although it may scare timid parents away. Fortunately, the CRF50F has the aforementioned throttle limiter, as well as a keyed ignition. We’re proponents of the ignition feature, because it means that little Johnny can’t sneak out and go for an unsupervised ride. 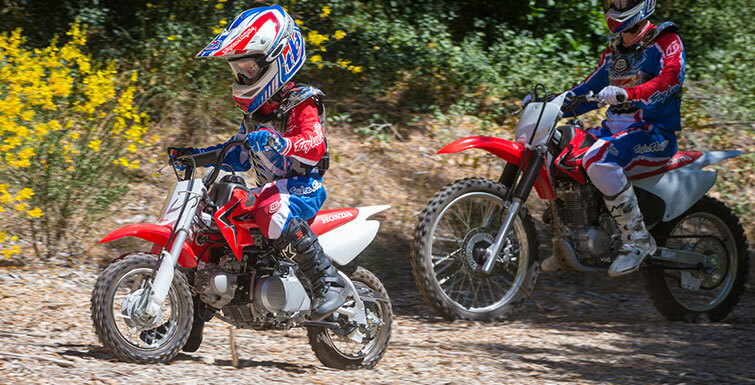 The Honda CRF50F provides a lot of the entry-level benefits of the PW50, but in a four-stroke, 3-speed form. The CRF50F boasts an air-cooled four-stroke engine, which is very durable and forgiving. Simply gas up the 0.7-gallon fuel tank and go. The 0.2-gallon reserve is a nice touch. Overall weight is 110 pounds, which shouldn’t be a problem for most children. However, it may be intimidating for smaller youth who are faced with a tip-over situation. Much like with the PW50, you can properly maintain the CRF50F with some parts from ProX, such as common items like the drive chain. The KTM 50SX, alongside the Husqvarna TC50, is the most competition forward 50cc dirt bike model, differentiating itself with disc brakes, taller seat height, longer wheel base, and even inverted air forks. 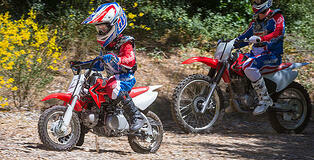 For those parents with a child who is taller and has a need for speed, the KTM 50SX is the perfect machine. This is the mini bike that has been used for years in the KTM Junior Supercross Challenge. Just like the other offerings highlighted in this article, the KTM 50SX has an automatic clutch. That’s where the similarities end. KTM designed the 50SX for competition use. The Austrian machine comes standard with robust disc brakes front and rear, a larger 12-inch front tire, 26.9-inch seat height, and 40.6-inch wheel base (which is nearly seven inches longer than the Yamaha PW50). 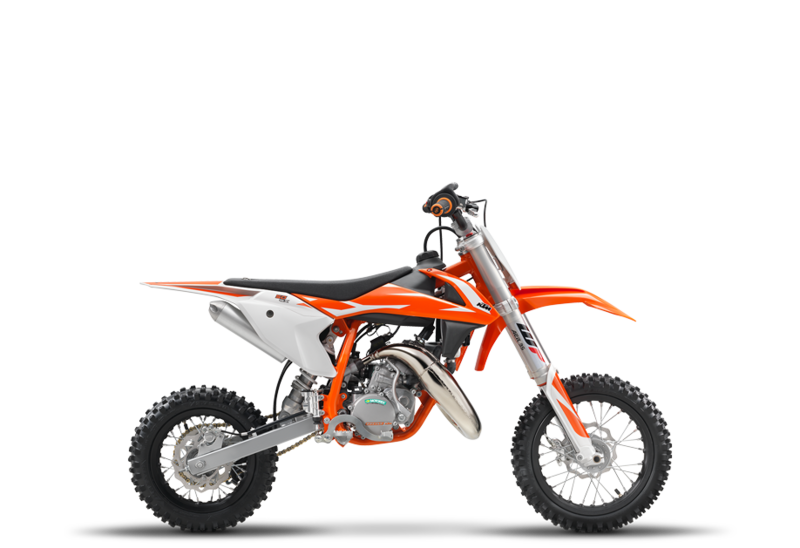 For younger or smaller riders, KTM also offers the 50SX Mini, which shares the same technology, but has smaller wheels, lower seat height, and a shorter wheel base. Those statistics will either encourage or scare parents away. The KTM 50SX may have the steepest learning curve, but it also has the greatest chance of keeping up with your child’s advancing skills. 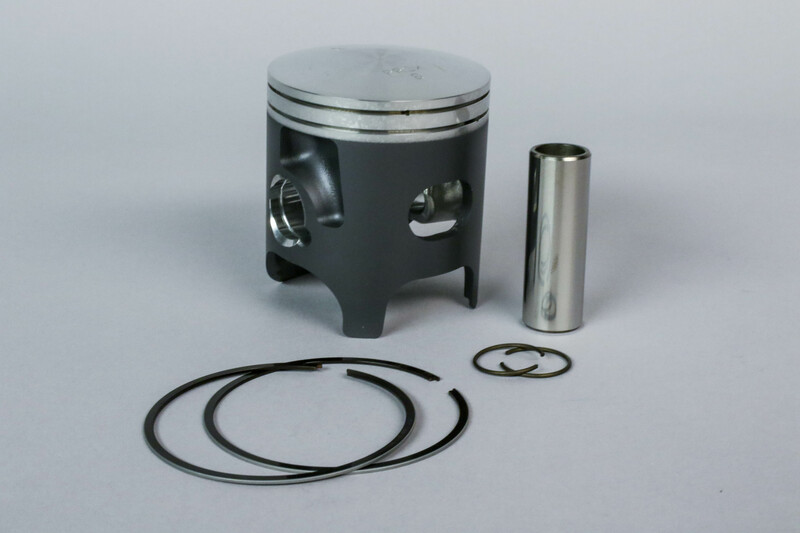 Note that KTM offers a power reduction kit that detunes the two-stroke engine to a more manageable 5.5 horsepower. If orange isn’t your color, then take a look at the Husqvarna TC50. It has the same basic specs as the KTM 50SX, but is dressed in white garb and sold under the Husqvarna name. Many top professional riders got their start on a KTM 50SX. It’s the bike that has won countless amateur titles and is extremely popular in motocross circles. 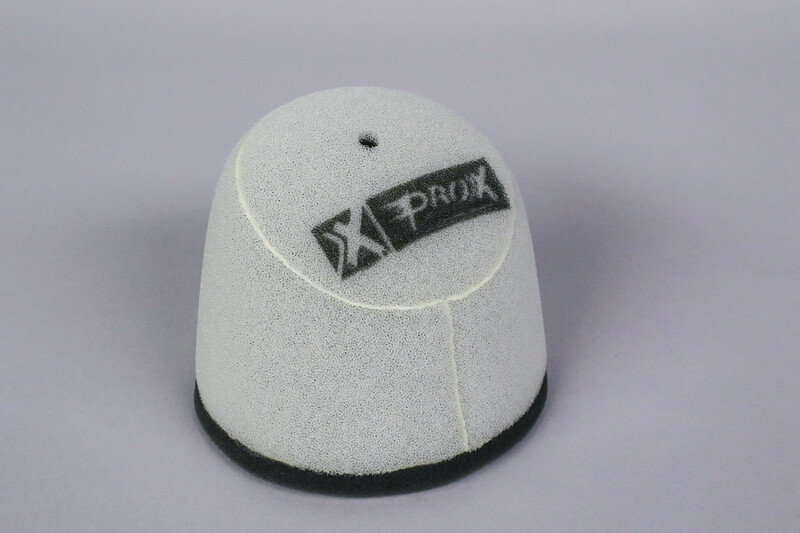 ProX makes a laundry list of replacement parts for the 50SX/TC50. 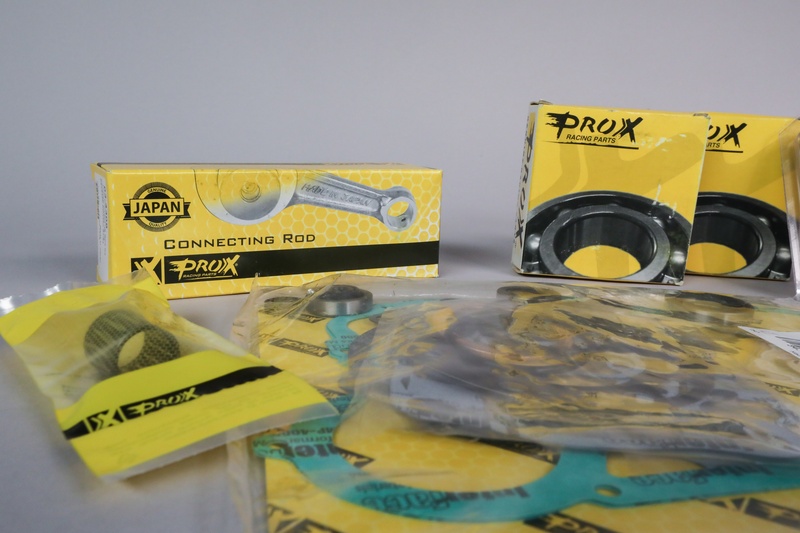 From air filters to brake pads, sprockets, gasket kits, pistons, rings, bearings, sprockets and more, ProX has you covered. We’ve covered the latest offerings in the mini bike market. Understand that there is a broad spectrum of choices. 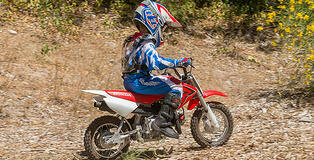 Do your homework and take into account all of the variables when buying your child his or her first dirt bike. Most of all, be confident in knowing that you’re giving your child one of the greatest gifts a parent can give – the joy and freedom of riding a motorcycle. Congratulations! Yamaha photos sourced from Yamaha Motor Corporation, U.S.A., KTM photos sourced from KTM Sportmotorcycle GmbH, Honda photos sourced from American Honda Motor Co., Inc.